Description of "Three Men Ride the Cliffhanger"
The Amigos set out on their most exciting and challenging adventure yet! SHE WHO MUST BE OBEYED challenges us to ride 'The Most Dangerous Road in the World' - the cliffhanger road from Kishtwar to Killar! It is high-up on the lip of the Himalayas- with a steep mountain-wall on one side and a high-dive down to the raging river below on the other. No road, no tarmac, no railings - a single error on the slippery muddy road would mean instant death! WOW! We scream. WOOHOO! WOOHOO! Just what we want to do! Let’s do more of it! Then the Amigos take it a step further - because we are crazy - and decide to do the 4500 meter high Sach pass as well! Same deal - no road, no railings, mountain and valley - and add high altitude as well! And things get a bit out of hand after that! We get carried away and keep going and going and going. Adi is carrying a mysterious secret! He slips away at Manali and only two Amigos remain. We do Rohtang pass and then go to the other end of the Cliffhanger road - towards Udaipur and Trilokinath. But I lose my backpack on Rohtang pass and become a bagless hobo! Never mind! Carry on! The Patron saint of Idiots will protect us. We summit the unknown pass of Shingo La on the Darcha-Padum road. It’s among the highest passes in the world - nearly 5000 meters - and most people haven’t even heard of it! .And then we do the Manali Leh road. Four high passes in a single day! Baralacha, Nakee, Lachulung and Tanglang in a single day! WOOHOO! Then we cross Khardungla and enter Nubra and Shyok valley. We explore the ends of India! From the Indo-Pak borders at Turtuk and Yarma, to the Indo-China border at Pangong. We reach the NORTHERNMOST POINT OF INDIA that a civilian is allowed to go to! WOOHOO! We explore the unknown ‘Shyok’ river - or ‘Death river’ as it is called in the local language. We almost die when caught in unseasonal rains in Ladakh! Riding in wet clothes causes dramatic fall in body temperature and we are lucky to get rescued by the Army. We come back to Leh and on a whim, decide to cover the ancient Indus river valleys of Dah and Hanoo valley as well! We meet the pureblood Aryan Brok-pas.Their DNA is said to be so pure Aryan that western women are rumoured to come here to try and get impregnated so as to bear the pure Aryan babies! Amazingly adventurous, Insanely funny and yet Awesomely Inspiring - Join the amigos on their most exciting and enjoyable adventure yet! It will be an amazing ride! You can follow the adventures with a ton of photos and videos from the ride on my website www.ketanjoshi.net. The ‘Amigos’ are three friends - Ketan, Aditya and Delzad - who share a common mental disorder - the love of riding long distances on their Royal Enfield motorcycles. We are the ‘Three Men on Motorcycles’. Ketan Joshi lives and works (if you can call it working) in Mumbai, India. He is an MBA and used to be a wage slave, but is now a corporate runaway. He travels all over the world, rides all over India and writes books whenever he can get over his laziness. Ketan writes across genres - he has written detective fiction, short stories and even a textbook on management - but it is his travelogues which have captured the imagination of people worldwide. His ‘Three Men on Motorcycles’ series has been compared to the works of Bill Bryson and Jerome K Jerome. 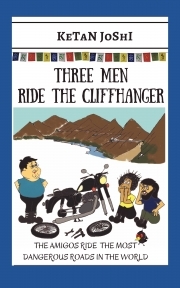 Reviews of "Three Men Ride the Cliffhanger"